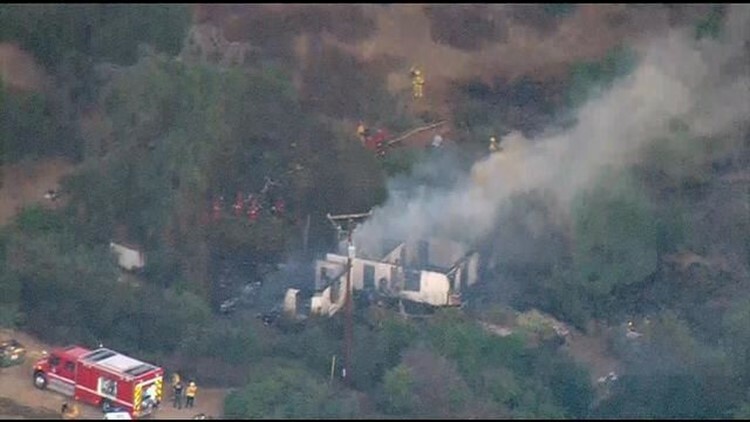 Cal Fire San Diego says it is responding to a "fully involved" house fire in the 19000 block of state Route 78 northwest of Ramona. RAMONA (CNS) - Fire engulfed a home in Ramona early Tuesday morning, displacing its lone resident and sparking a brush fire that scorched about a quarter acre of vegetation, officials said. The blaze was reported at 4 a.m. in the 19000 block of state Route 78, northwest of Ramona, between Ramona and Escondido, a Cal Fire San Diego spokesman said. The home was fully engulfed in flames when firefighters arrived and began battling the blaze. Flames extended into the brush around the house and blackened about a quarter acre before Cal Fire crews stopped its spread and brought it under control, the spokesman said. The home's resident made it out safely. The cause of the fire was not immediately known and was under investigation.